Delaware County Board of Elections team members set up 100 voting machines at a time for testing and loading of ballots before each election cycle. The bipartisan team is composed of one Republican and one Democratic who work together making sure the machines are ready for election day. Pictured working diligently to make sure the county has a fair and honest May 8 primary election are, left to right, Richard Helwig, John Rybke, Terri Cramlet and Christina Voise. 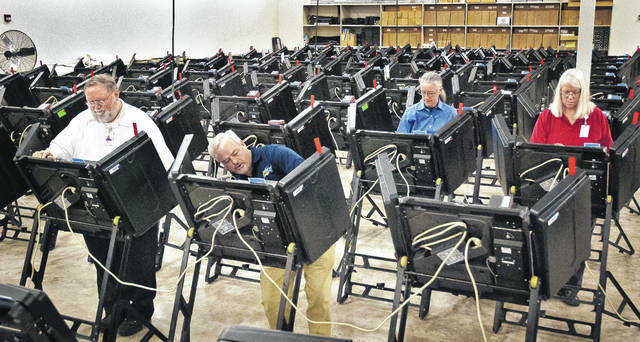 The Ohio Statehouse announced Wednesday the Ohio Senate has taken the first step in providing funding to counties to update voting equipment. Senate Bill 135 will move to the Ohio House of Representatives for consideration and vote by its members. The bill, which contains funding to maintain fair and secure elections, passed by a 32-1 vote in the Senate. The lone dissenting vote was cast by Sen. Kris Jordan, R-Ostrander. Herron said in “round numbers the county has 138,000 register voters.” The machines that voters are using were purchased with federal dollars through the Help America Vote Act in 2005 at a cost of $115 million. Herron reported in May 2017 that there were points of failure starting to happen with the current machines and that the board could “only get refurbished machines.” About the same time, she reported to the board of receiving a directive from Husted’s office to replace all voting machines by 2020, which she estimated the cost to replace the county’s machines would be $4 million. The BOE met with the county commissioners in a special session at the end of May 2017 to discuss the purchase of new machines. Both boards were in agreement to wait 12 months to see if the state would certify machines similar to the ones used by the county and if the state would partner with the counties in sharing the cost of purchasing new machines. Senate Bill 135 is primarily sponsored by State Sen. Frank LaRose, R-Hudson, who introduced it in the Ohio Senate in April 2017. The bill’s funding break down is as follows: counties with 0-19,000 registered voters will be given a base amount of $205,000; those with 20,000-99,999 registered voters will be given a base amount of $250,000; and counties with 100,000 or more registered voters will be given $406,000. This entry was tagged D. Anthony Botkin, Delaware County Board of Elections, Delaware County Commissioners, Herron, SB-135. Bookmark the permalink.